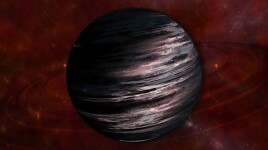 StarDiver gets gas giants this week. Come take a look at flowing, churning, bands of gaseous greatness. Playing with gas this week has been quite a bit of fun. While I have to admit I was tempted to just make a gas giant texture, smack it on a sphere and call it done, it just didn't feel right to have such a beautiful thing be so static. So on went the thinking cap on how I could make a gas giant the way they were meant to be seen -- with flowing bands of gaseous awesomeness. The goal for StarDiver has been to create procedural systems that can be reused to make a variety of similar things. 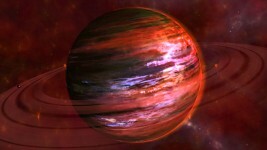 Gas Giants are no exception. We have tweaked the system to be able to kick out a mind boggling array of different looking gas behemoths. I've included a couple of stills to see the generation system making quite different looks, but please watch the video to see the gaseous bands flow. It is mesmerizing. Lovely colors there! Stoner planet N°1!